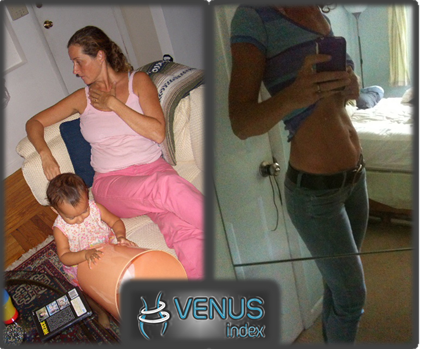 Naomi is a veteran Venus who has been with Venus since the beginning in 2010. She successfully transformed her body and has maintained, and even improved her physique over the past 5 years as she progressed into her 50’s! “Hi! I’m Naomi Sandoval. I live in the USA but I’m not fat. I really do look like this photo. It’s crazy. Sometimes I pinch myself to make sure it’s true! I grew up during the 1970s when being fat was rare. It wasn’t rare in my family though. We all accepted that once we became adults, we’d get fat. I skirted this “inevitability” thanks to the 1980s gym bug. I used exercise to stay ahead of weight gain. Until my mid-30s, I worked out 5 nights a week for 1-2 hours and was a weekend warrior doing whitewater C1 slalom paddling on rivers all up and down the east coast. It was a fun time for sure! I was also happy to preach to anyone about my way of life. Funny how my coworkers, all parents, didn’t really look too interested! Unfortunately, this plan requires that you stick with it; eating more than you burn is going to lead to weight gain. There isn’t any magic ticket. I definitely fell prey to the work it off mentality. When I became a mom, gym time came screeching to a halt and weekend warrior exploits became a fond memory. Like most people, I found becoming a parent so time-consuming that I was not able to stay consistent with my workouts and I fell into the trap of believing that the weight gain was a result of pregnancy. I was told to love and accept my new body and be grateful for what it had given me. Yet every morning, before I got out of bed, I felt my bloated flabby middle and wondered how I’d gotten like this. I’d remember what leanness felt like and do some magical thinking that today would be the day I’d wake up and find out this had all been a bad dream and I was still lean and trim as I’d ever been. I’ll grant you that having small children is all consuming and is no time for personal growth. But that doesn’t do anything to temper the niggling feelings of dissatisfaction when you see this in the mirror. If you look at many of my before photos, I’m slumping because I was constantly exhausted and in pain and didn’t even have the strength to sit properly, my smile is not exactly dazzling. I wish I’d known then that eating less doesn’t take up any time! Heck, not eating at all once or twice a week is a huge time saver! And who doesn’t enjoy the added bonus of saving money on the cost of food not purchased! Letting go of the mythical 2000 calories a day I thought I got to eat (which did require some mourning, I’ll grant you) and finding out how much I actually needed to maintain and how much I needed to eat to reduce fat was like discovering the Secret to Life, the Universe and Everything! I’d become immobilized because I assumed if it took years to put the weight on, it followed that it took years to take it off. In actual fact, the bulk of my weight came off at about a pound per week. Towards the very end, that rate slowed to about ½ pound per week or less, which is excellent progress to avoid fat loss rebounds upon hitting the goal. After all, fat loss does require focus and effort. There’s no need to risk needing to do it all again or worse, rebounding and concluding that diets don’t work or your metabolism is broken! 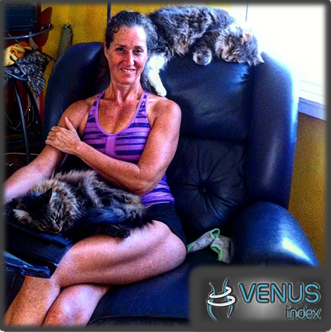 The other piece of my journey was becoming aware of brilliant Venus Index ratio research as outlined in the Venus Index Workout program. Simply learning what was still not quite ideal about my shape and how to continue to make improvements has made all the difference. Achieving the ideal metrics has allowed me to finally present my body with full confidence. A most wonderful thing happened to my family after my transformation. My husband jumped on board too! I won’t lie to you. It’s not possible to change your partner nor force them to do something they are not ready and willing to do. I’ll share a little secret with you should you find yourself in the same situation. There are free podcasts! All the research, all the experiences of the winners, it’s all in there. So all you have to do is pop one in while you’re in the car together or doing dishes and let John’s soothing voice wash over your unsuspecting partner. I’m telling you, this stuff is pure gold! And when you’re ready to get out of The Matrix, get the Uncensored Podcasts. Energy. It’s a funny thing about working out. Expended energy begets bonus energy for every day living. Strength. Before it was a job to do the most basic of things like get on and off the toilet or squat down and get something from the floor. Success spillover. Due to the Attitude of Accomplishment from following simple programs and seeing consistent results, other areas of my life fall into place. Family success spillover. We are now all exercising consistently and have improved our body fat levels. Through leading by example, the family lifestyle of health just is. There is no nagging nor persuading the kids to move and they understand about enjoying treats, just not every day. Sleep. There is nothing like being healthy, movement and the feeling of accomplishment to facilitate healthy sleep. Mental focus. Gone are the binge induced foggy afternoons. The losing the thread of the conversation. I come from a time when it was not the norm to be fat. I see us winding up in wheelchairs like in the movie Wall-E and far sooner than we all think. I would like to be the touchstone you can believe in as you find your way on your own journey to your best self. I want us to reverse this trend and return to being lean. As with all growth, you must take responsibility for your journey. I am here to offer experience, wisdom and motivation. You do the rest. 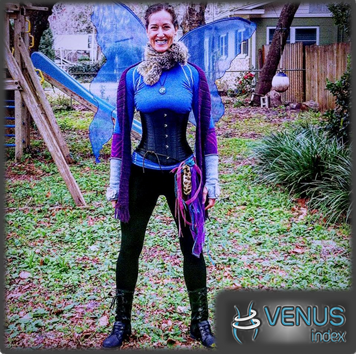 Here is my Venus Index community profile.